So I'm not really a mommy blogger, despite motherhood being the thing that defines this season of my life best. I start and stop writing about my daughter, even though there's so much to say I try to think about her privacy vs. sharing my parenting experiences. Anyway, this is something that's been bugging me and I want to write about it as a way to organize my thoughts and consider my next steps. What Jane eats is important to me. I'm not a perfect hippie, but I aspire to some aspects of the lifestyle -- in particular whole foods free of chemicals, dyes and extra sugar. So far I've been able to do an OK job for Jane. Being in charge of her meals means she is at least offered a variety of choices, all of which are good for her. She does not eat super sweet things -- including ice cream, candy, cookies, Kool-aid or even juice -- no matter how much I know she would love them. That's not to say things don't slip in -- she eats her share of processed crackers, cheddar bunnies or rockets (Trader Joe's brand goldfish), pretzels, dip, pizza and salad dressing. She's tried cake (and talks about is a lot!) and gets whipped cream on her berries occasionally plus sneaks a few chips every now and again too. She can eat a grilled cheese the size of her head and loves quesadillas. Let's just say that her diet isn't perfect but it could easily be derailed. Especially as she grows and is going into more situations where I'm not in charge of what she eats. A particular sore point for me is our church Sunday school. Jane was invited to join the preschool class this fall. I've decided to wait on letting her start -- partly because I want her to be fully potty trained -- but mostly because I don't want her being fed junk food every week. 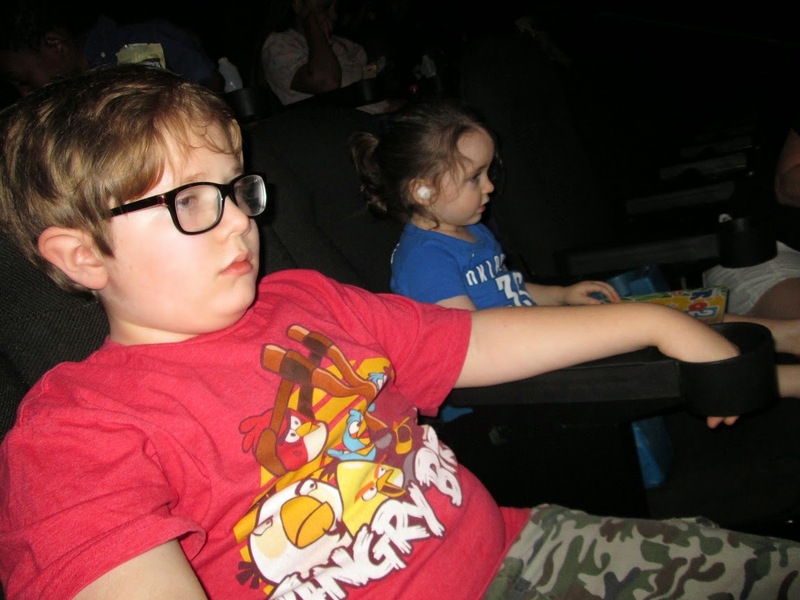 I want our church to do better by our kids -- ALL our kids. I know I can't wipe out the mentality that "treats" for kids are a way to show love, which I think is a big part of the food selection at church. Truthfully I find myself wanting to do that often -- whether with food or toys -- so I fully realize this is a "pot-kettle-black" situation too. (In more ways than one, since my own diet leaves a lot to be desired ... Diet Coke and Diet Dr. Pepper addiction are clear examples of that!) There's also the ease factor of most unhealthy foods -- packaged, keep forever and kids will actually eat them. But I don't know if I've got the fight in me to even make the change for the littlest kids, and so I've put it off. I said I'll reevaluate sending her to the class when she's 3 in a couple months. But every Sunday I feel a tug -- of what she's missing in the class in terms of spiritual education. The nursery where she is (and where I complained about the snacks there until they agreed to cheerios, pretzels and water) doesn't include any type of Bible story or praying, both of which Jane is ready for. I shouldn't have to choose between her spiritual health and her physical health, and I know in both instances Shawn and I are the primary factor for now. I don't see a solution yet, except for getting into it/really pressing for better food choices at the preschool class level. Or should I change? Am I being overly controlling about what goes into Jane's body? Is it inevitable that she consume junk, and therefore just go with the flow? It seems like the other parents at church take that approach. (And I'm not questioning anyone's dedication for their kids or their kids' health.) Can I hold it off a little longer? I've used Mooglyblog patterns before and loved them, but I finally subscribed to the blog itself. It's amazing and full of great crochet ideas and patterns. Love. 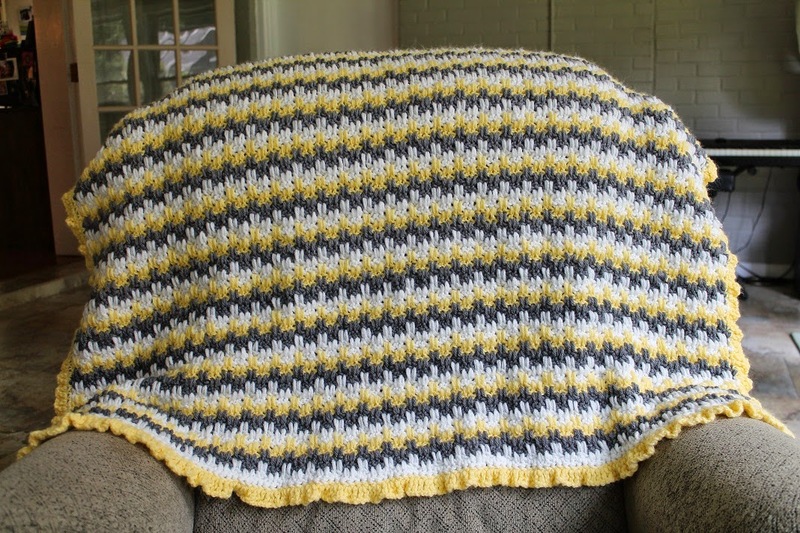 Anyway I made the Leaping Stripes & Blocks pattern for a to-be-born baby using dark grey, white and honey bee yellow. I didn't like the color choices at first, but as I kept plugging away they grew on me. 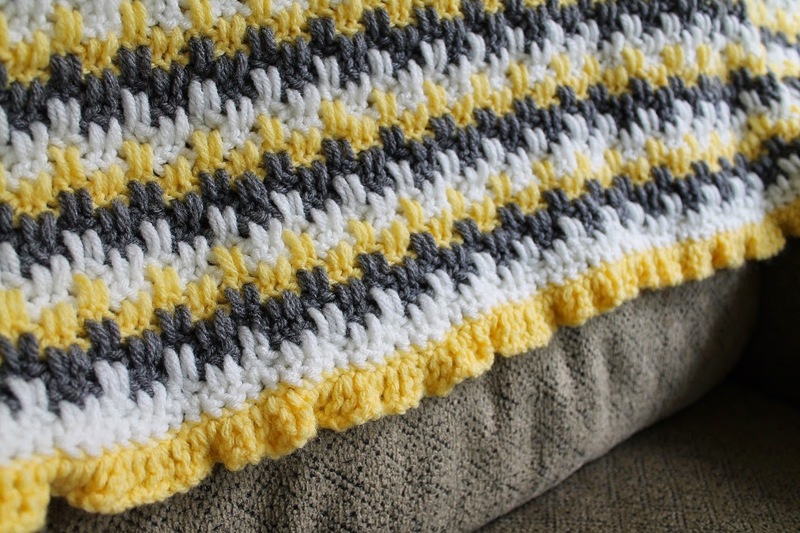 There are a lot of great yellow & grey crochet inspiration pins that I looked through to help myself believe that this combination was winning. I'm pretty much won over, although I think I would have liked it more had I made the stripes of color wider. I added a soft ruffle edging, which I borrowed from a pattern in my Gumdrops and Rainbows pattern leaflet. It's basically *double crochet, chain 2 in first stitch, (dc ch2 dc ch2) in second stitch and repeat. I had checked out a Crochet to Go ebook from my library and tried a pattern there too. 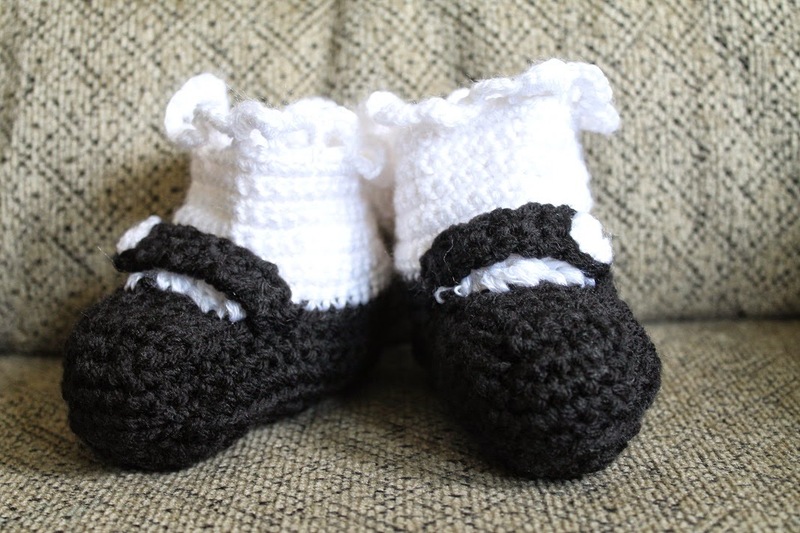 It was for crochet baby Mary Jane shoes. I followed the pattern exactly and made the sock with my first attempt. They looked somewhat crazy, in part because I couldn't figure out what "curved part" meant when looking at an oval, and also because the sock is open in the back and very floppy. 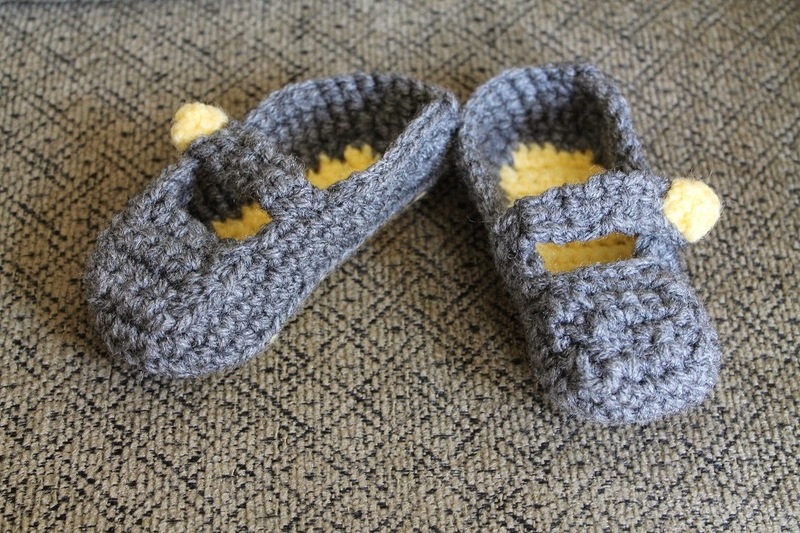 For my second try I omitted the sock and used yellow for the sole and grey for the shoe itself. 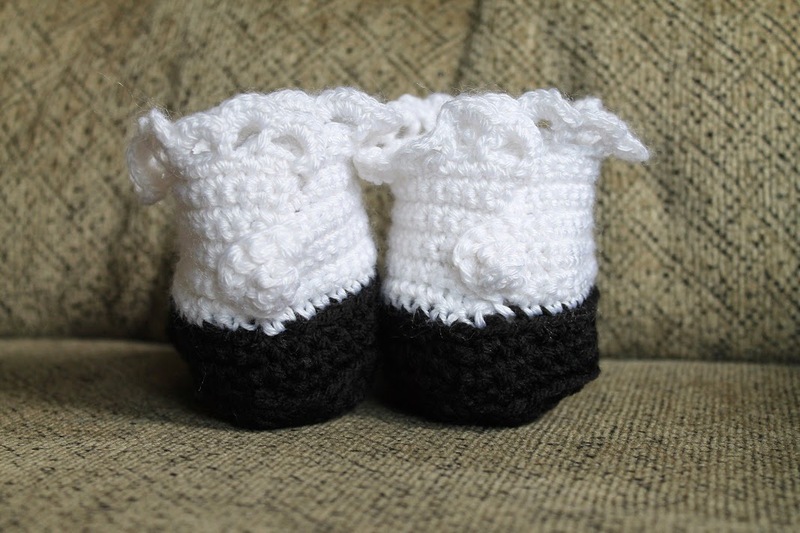 I made them in about 2 hours (watching TV, so not working the entire time). Very easy and adorable. I love the way the second pair turned out. They'll go with the blanket when it's closer to due date! This is a ridiculously expensive treat, if you look at it from the cost of brewing and chilling coffee yourself. If you look at it against the cost of buying individual iced coffees at Starbucks then it's a downright bargain! Either way it's a thing I bought that I love. I grabbed it on a whim when I was looking for buttermilk (none to be found in my regular grocery store). I really like it -- although I'm not super particular about my coffee so results may vary! I put it over ice and add some milk or fat-free half and half. Sipping from a straw completes the experience for me.